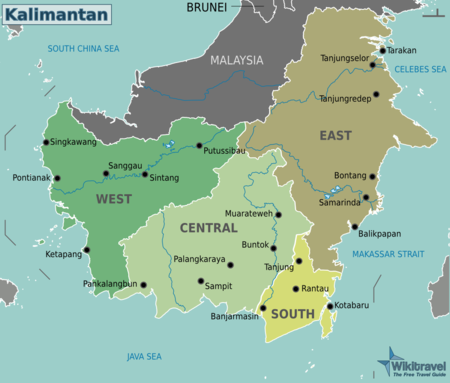 In 2012 the new province of North Kalimantan was formed. This new province was carved out from the province of East Kalimantan. Balikpapan - is called Oil City in Indonesia, because most of the major oil & gas companies have offices there. The living cost in Balikpapan is high because it is difficult to find vegetables & fresh meat. The temperature fluctuates between 28C and 32C. Banjarmasin - the biggest city in Kalimantan. Famous for its floating market. The Borneo rainforest is 130 million years old, making it one of the oldest rainforests in the world and 70 million years older than the Amazon rainforest. Borneo is very rich in biodiversity compared to many other areas. There are about 15,000 species of flowering plants with 3,000 species of trees, 221 species of mammals and 420 species of birds. Subject to mass deforestation, the remaining Borneo rainforest is one of the only remaining natural habitat for the endangered Bornean Orangutan. It is also an important refuge for many endemic forest species, as the Asian Elephant, the Sumatran Rhinoceros, the Bornean Clouded Leopard, and the Dayak Fruit Bat. There are 74 living languages spoken in the 4 provinces. Indonesian serving as the official language, while the Banjar language serves as a lingua franca on much of the island except in West Kalimantan, where Malay is more common. Other major languages spoken in Kalimantan include Dayak (Bornean) and a number of dialects related to the Chinese Hakka and Minnan (Hokkien) languages. Sepinggan International Airport (IATA: BPN) near Balikpapan is the primary airport on the Indonesian side, and fields flights from Kuala Lumpur (Air Asia) and Singapore (Silk Air) as well as many Indonesian cities, but there are no direct flights from the tourist hub in Bali. Syamsudin Noor Airport (IATA: BDJ) is a regional airport located in South Kalimantan, has a good connection to major cities in Indonesia (Jakarta (Soekarno-Hatta), Surabaya, Yogyakarta, Denpasar/Bali, Makassar, Balikpapan, Pontianak). Distances on Kalimantan are long and public transport is spotty and expensive. The easiest option may well be to book an arranged tour. Borneo Discovery Tours Kalimantan office, 62 542 7254677 or 24hrs cell.08125361221 (Office Hours 08.00am - 17.00pm), . De'gigant Tours Borneo Jalan Martadinata Raudah 1 # 21 Samarinda, +62 8125846578, [email protected] , Kalimantan The Passion For Adventure Travelers. Most diving activities takes place in the Berau Archipelago in the Celebes sea, around the islands of Derawan, Sangaliki and Maratua in East Kalimantan, there are also some less visited dive sites in West Kalimantan, these include Batu Payung and Radayan island in the vicinity of Singkawang and Karimata islands reserve further south, some 100 kilometers of the coast from Ketapang. This page was last edited on 5 December 2018, at 06:43.